We are your local window cleaning company for the New Bedford, Fall River, Mattapoisett, Seekonk, Marion, Dartmouth, Fairhaven, Westport, Acushnet, Somerset, and Swansea, MA! Do you live in Rhode Island? We also serve Providence and the metro RI area. Click here to visit our RI site. 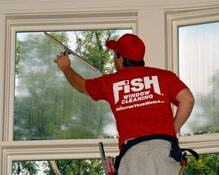 Our specialty is in giving you perfectly clean windows, and we are ready to serve your business or home. Our window cleaners are trained to provide the superior customer service you expect when in the workplace or the quiet environment of your home. Window cleaning is our profession. It’s not just a job we do, and we treat it that way. We maintain storefronts and commercial buildings, helping you to achieve a polished look to give your customers a good impression. We provide cleanings ranging from weekly to annually, tailoring our services to the needs of your business. Regardless of your budget, we can put together a program for you. We’ve led the industry with a premiere safety program to ensure the protection of our customers and cleaners. We also provide the peace of mind that bonded, and insured window cleaners will be maintaining the appearance of your business. Serving New Bedford, Fall River, Mattapoisett, Seekonk, Marion, Dartmouth, Fairhaven, Westport, Acushnet, Somerset, and Swansea, MA.